Cavalier King Charles Spaniels were developed from the toy spaniels that were popular pets with the British royalty from the seventeenth to nineteenth century. In the 1920s an American named Roswell Eldridge started searching for a dog that resembled the dogs in the old paintings depicted in many of the 16th, 17th, and 18th centuries painted by famous artists such as Van Dyck and Gainsborough. He offered a prize of 25 pounds (a lot of money at that time) for a dog that best resembled the types he had seen in those paintings. From that offer and incentive, the Cavalier King Charles Spaniel was developed. Sadly, Mr. Eldridge died before he found the dog he was looking for. It is currently the most popular toy breed in England. Cavaliers (as they are affectionately called) are nicknamed “The Comforter Spaniel,” and that pretty much describes this wonderful little dog. They are affectionate and thrive on human contact. They make a wonderful family dog. The Cavalier is playful, energetic, friendly, gentle and moderately easy to train. They are known for their sensitivity and empathy, and it shows in their expressive eyes. Cavaliers are active and energetic and require a moderate amount of exercise. They love children; however, as with any dog, you must train children and the dog properly to avoid any unintentional injuries. Cavalier King Charles Spaniels usually weigh between 10 to 18 pounds and stand approximately 12 to 13 inches tall. They are short and compact in their build. 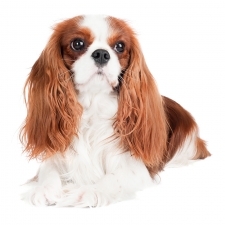 Cavaliers have long, silky hair that comes in red and white, ruby, tricolor, or black and tan. The color Blenheim (a popular color of Cavaliers) derives its name from the country estate of the Dukes of Marborough at Blenheim Palace, where a particular strain of red and white Toy Spaniels was bred. Their coat needs regular brushing but not trimming. Cavalier King Charles Spaniels are the 12th most popular breed of dog registered with America's Pet Registry Inc. It’s said that King Charles II, who reigned from 1660 to 1685, never went anywhere without his little spaniels. He decreed that they should be allowed in any public place, including the Houses of Parliament.